Marvel Comics has revealed another teaser for the new Guardians of the Galaxy 2019 team where some our guesses were correct, which happens to include Richard Rider Nova! However, the new teaser notes only six of the below characters will be a part of the new team that launches in 2019. 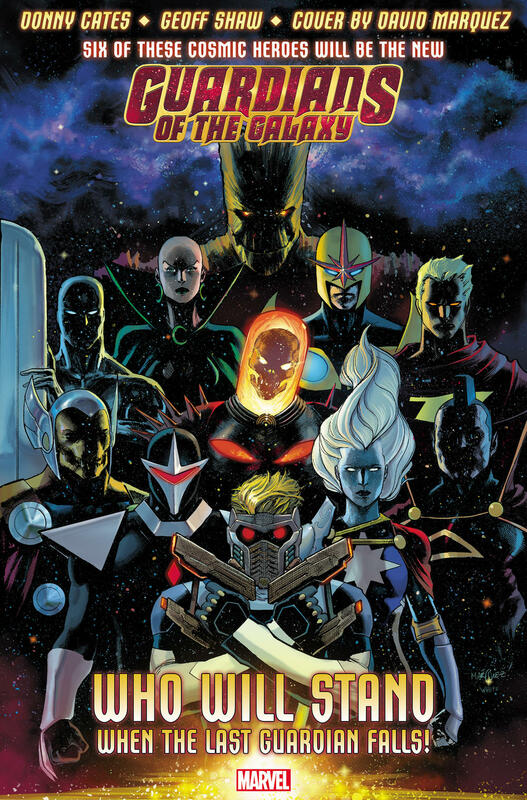 The teaser images features Silver Surfer, Moondragon, Groot, Nova, Adam Warlock, Beta Ray Bill, Darkhawk, Cosmic Ghost Rider, Star-Lord, Gladiator and what looks to be Captain Marvel Phyla-Vell(?). Again, so only six of the members will be on the new Guardians of the Galaxy team. Any guesses? I'm actually hoping Richard Rider Nova is NOT on the team and gets his own book again! The new Guardians of the Galaxy is from Donny Cates and Geoff Shaw.